Additional URL, And Now A YouTube Channel! I am excited! I finally have my YouTube channel up and live, bringing you informational videos on various trucks. It just went live, so the videos are limited, but there will be many more to come in order to help you look at units and options at your convenience! Of course, I will bring units to you -- at your place of business -- so that you can touch them yourself and review options in person. Subscribe to the channel and you will see when videos go live! If you find the videos informative, please remember to "Like" them so that I can learn what you like to discover. Also, I have another URL! I was driving, had an epiphany, and found MyCommercialTruck.com was available. It'll still bring you here, but that's even EASIER to remember! I need an eld! Where do i go? "CDL requirements become more confusing when the vehicle is towing a trailer. There are three key aspects to consider when assessing CDL operator requirements for commercial work trucks involved in towing a trailer: truck GVWR, trailer GVWR, and GCWR of the truck-trailer combination. Trailer GVWR is most critical to determining when a CDL is required. When a trailer has a GVWR of 10,001 pounds or more and the combined GCWR of the truck and trailer is 26,001 pounds or more, a CDL is required by the operator. For example, if a trailer has a GVWR of 11,500 pounds and is towed by a truck with a GVWR of 15,000 pounds, resulting in a GCWR of 26,500 pounds, then the operator must have a CDL. In contrast, when the trailer in the truck-trailer combination has a GVWR of 10,000 pounds or less, the CDL requirements allow for a greater GCWR for both the truck and trailer without requiring a CDL license. For example, a truck with a GVWR of 26,000 pounds or less can tow a trailer with a GVWR of 10,000 pounds or less and not require the operator to have a CDL under federal requirements. However, CDL requirements mandate that the truck and trailer GVW not exceed 26,000 pounds and 10,000 pounds, respectively. In short, the truck and trailer cannot be overloaded." Ugh. I've read the rules and been confused. Haven't you? I was speaking with a landscaper yesterday and getting their insight. : They said what I thought I understood when I read the rules: When pulling a trailer with a non-CDL truck, you need to add both the trailer GVWR and the truck GVWR together and if it >= 26,001#, you need a CDL. Fortunately, I found today that YOU DON'T! Yep, I read on both the FMCSA website and PA DOT website. FMCSA website states "Question 6: A driver operates a tractor of exactly 26,000 pounds Gross Vehicle Weight Rating (GVWR), towing a trailer of exactly 10,000 pounds GVWR, for a GCWR of 36,000 pounds. HM and passengers are not involved. Is it a Commercial Motor Vehicle (CMV)s and does the driver need a CDL? No to both questions. Although the vehicle has a Gross Vehicle Weight Rating (GVWR) of 36,000 pounds, it is not a Commercial Motor Vehicle (CMV) under any part of the definition of that term in §383.5, and a CDL is not federally required." There it is! The answer we all look for. Do you have any questions I can answer? Ask away! 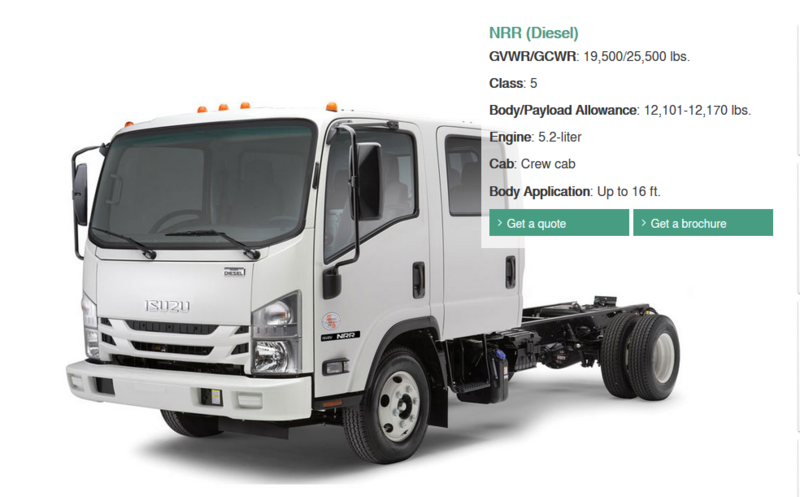 Isuzu Now Has The NRR 19,500# GVWR IN CREW CAB! That's right! It's finally here: The 19,500# GVWR Crew Cab that you need for your landscape crew or restoration crew. It will take up to a 16' body on it with the proven, time tested Isuzu 4HK1 diesel engine! It's new to the 2019 Model Year (in production now and arriving ~ March 2018), so quantities will be tight: Order yours now!